Organic ingredients from small tea farms around the world provide your morning caffeine dose in heavenly sips. Tea virtuoso Scout Urling obsesses over every detail of her teas. Her deep knowledge of botanicals and unerring sense of taste enable her to blend the finest teas in original combinations. She sources only organic teas, cultivated with care and heirloom traditions in small tea gardens around the world. 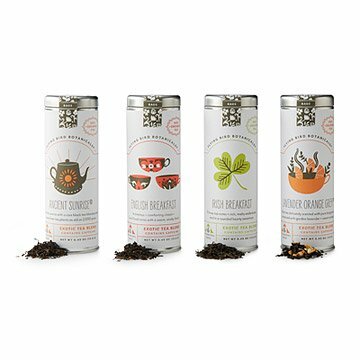 Four beautiful tins of tea are each filled with six perfectly portioned, biodegradable pyramidal tea bags (their shape creates room for maximum flavor extraction of each tea). This wake-up set combines two classic morning teas (Irish and English Breakfast) and two original blends of Scout's invention. Handmade in Bellingham, Washington. ANCIENT SUNRISE: A rare black tea blended with leaves from tea plants as old as 2,000 years. A blend of organic Himalayan and Chinese black tea, including leaves from protected strands of ancient tea plants. ENGLISH BREAKFAST: A timeless, comforting classic—round, floral, and subtle fruity notes with a warm, earthy, smoky finish. A blend of organic black teas. IRISH BREAKFAST: Citrusy top notes and rich, malty undertones ending in a rounded hearty sweetness. A blend of organic black teas. LAVENDER ORANGE GREY: Organic black tea leaves delicately scented with pure bergamot and enhanced with garden lavender and sweet orange. 100% organic. Each tin contains six pyramidal tea bags. Packaging is really cute and all the teas taste good. They aren't that strong though and don't seem high quality for the price. Got this present for my Mother-in-law who is a daily tea drinker and she has been thrilled with it. Great gift for a tea-lover! I bought this for a colleague's 5-year anniversary at our company. She loves tea and trying different flavors. She opened each of the tins and inhaled the aromas when the gift arrived. She said they all smelled delicious! Amazingly flavorful tea. I bought this as a "gift" for myself, as I was purchasing Christmas gifts for family and wanted to give myself something special too. I only wish it wasn't so expensive, because I'd like to drink this every day! Very nice tea set. Perfect gift for a tea lover.